Samsung Electronics has updated and rebranded its app store, in an apparent bid to cut into Google’s revenue from its Play store for apps running on Android devices. The new Samsung Galaxy Apps store has “hundreds of apps” exclusively available to users of Samsung Galaxy mobile devices, the company said Friday in a blog post. The redesigned app store will offer higher customization of mobile devices and a variety of promotions and discounts to users of Samsung Galaxy mobile devices, it added. The earlier store was called Samsung Apps. The revamped app store has a redesigned user interface to display apps in three categories: Best Picks, Top, and For Galaxy. Best Picks lets users find recommended apps and promotions, while Top displays the most popular apps which can be viewed by their popularity, date, and price. The For Galaxy category is in turn divided into four sections. A Galaxy Gifts section lists premium apps exclusively for Galaxy devices, while a Galaxy Essentials section features “must-have apps” for Galaxy devices, the company said. 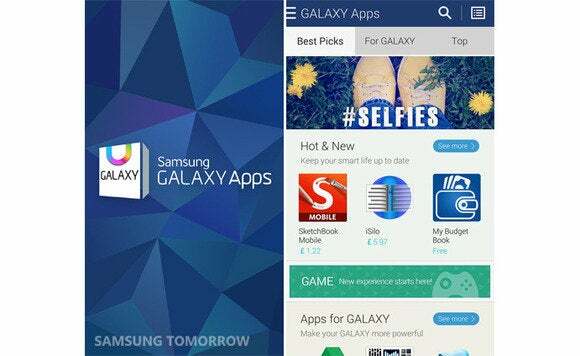 The third For Galaxy section, called Apps for Professionals, is described as “the home of business focused apps and other services that fully utilize the features of Galaxy devices.” A Galaxy Specials section will let users download apps created by using Samsung SDKs (software development kits), the company said. Samsung is the dominant vendor of smartphones and tablets based on Google’s Android operating system. It led all Android vendors in 2013 with a 39.5 percent share of smartphone shipments for the year, according to IDC. Google recently announced that its upcoming generation of Android, dubbed “L”, will feature Samsung’s Knox security software. But the South Korean company has also tried to keep some distance from the Internet giant, including by using the rival Tizen operating system in devices such as the Gear 2 and Gear 2 Neo smartwatches and the Samsung Z smartphone, with a TV running the OS planned for next year. It is not clear at this point whether Samsung aims to promote a Galaxy ecosystem including apps separately from one around the Tizen products. Samsung and Google could not be immediately reached for comment. Samsung Galaxy Apps will eventually be available to more than 130 million users in 161 countries. The company forecast earlier this week that second quarter sales and operating profit would be lower than in the same quarter last year, blaming competition in China and Europe and an overall slowdown in growth in the smartphone market.